← A LOOK AT THE HUNTER’S MONKEY! Image Credit & Copyright: NASA/ESA Hubble Space Telescope. CLICK image for larger view and look below for information and links. As promised in the previous post in which we detailed NGC 2174 “The Monkey Head Nebula” I said we would take a closer look into the monkey’s eye (left eye as it were). So here we are; this infrared image was taken by the Hubble Space Telescope in celebration of the 24th anniversary of its launch back on April 24, 1999 and it displays the region in amazing, never seen before detail. Let me point out that in comparison to the previous image by J.P. Metsavainio, this image of the eye region of the monkey has been rotated 90 degrees counter (anti) clockwise. 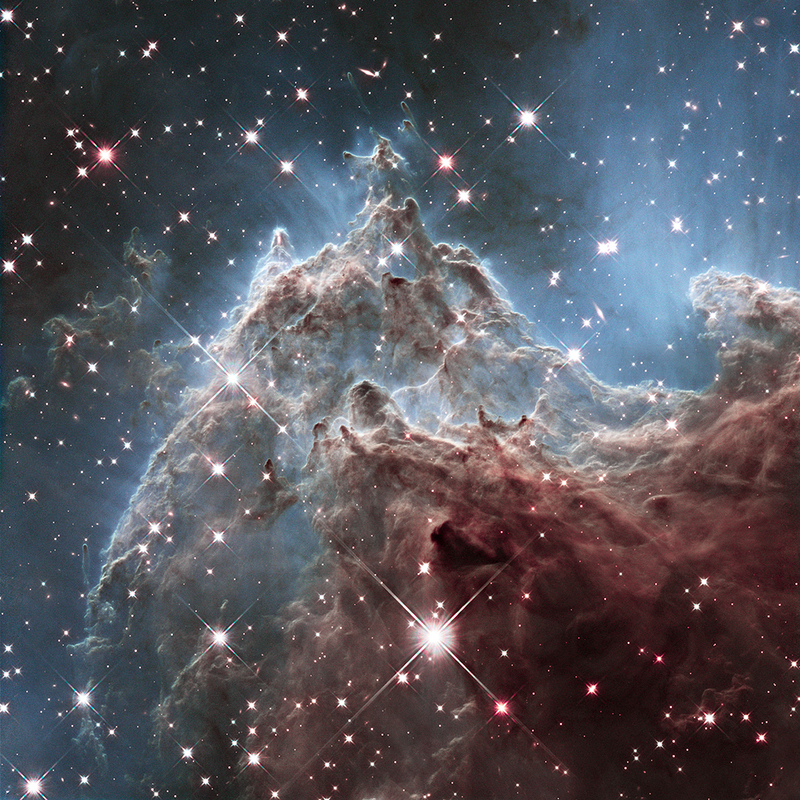 This mountain of star formation reminds me a lot of “Mystic Mountain” in the Carina nebula. This mountain, unlike terrestrial mountains didn’t rise from the ground in a tectonic collision, but instead this mountain is being carved from the top down. This region, as it has star formation taking place within it, is much denser than its local surroundings. So as the stellar winds from open star cluster NGC 2175 (not in this image, off to the right) bathe it in ultraviolet radiation or stellar winds, this mountain is carved out of the molecular countryside. Eventually, due to interstellar weathering, this mountain will erode away into nothing. Its contents; those newborn and near birth stars within, have a long road of survival ahead of them. Those far along enough in the accretion process will survive just fine and possibly join NGC 2175. Others that haven’t gained the fusion foothold may not fare so well if their mountain cocoon is eroded out from around them. Let me know what you think of this “zoom” in on the monkey nebula. I did one last week as well with IC 1396 and the Elephant Trunk Nebula that you all seemed to enjoy. So lemme know, I have quite a few more in mind. 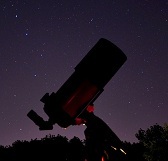 NAME: Region associated with NGC 2174. WHAT IS IT? : Star forming region. HOW FAR AWAT IS IT? : Approximately 6400 light years. WHERE IS IT? : (Exact RA/DEC J2000): RA 06h 09m 23.7s / DEC +20° 27′ 34″. Image | This entry was posted in Astronomy (Learning), Astrophotography (DSOs), Images, Nebula (Emission, Reflection), Star Clusters (Globular-Open), Stars (Non-Sun Related), ZOOM Posts and tagged Astronomy, Astrophotography, Astrophysics, Cosmology, Cosmos, ESA, Hubble, Monkey Head Nebula, NASA, Nebula, Space, Telescope, Universe. Bookmark the permalink. 1 Response to MONKEY SEE…….